Controlled human studies have revealed a diverse range of health benefits from consumption of probiotics, due largely to their impact on immune function or on microbes colonizing the body. 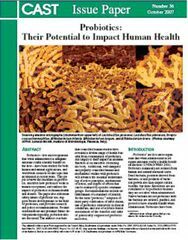 Probiotics are live microorganisms that when administered in adequate amounts confer a health benefit on the host. Probiotics have been studied for both human and animal applications, and research on this topic has accelerated in recent years. The Council for Agricultural Science and Technology (CAST) has released a new video based on its Issue Paper, Probiotics: Their Potential to Impact Human Health, as a contribution to scientific communication on this important topic.